I was recently chosen by BzzAgent to review Vaseline's Compressed Deodorant. * Use it just like your normal Vaseline 150ml and it will last just as long. * New technology delivers the same amount of protective ingredient in a softer, more gentle spray. I'm always quite wary of deodorant claims and find many just don't last long on me at all and certainly don't last the '24 or 48' hours they claim! 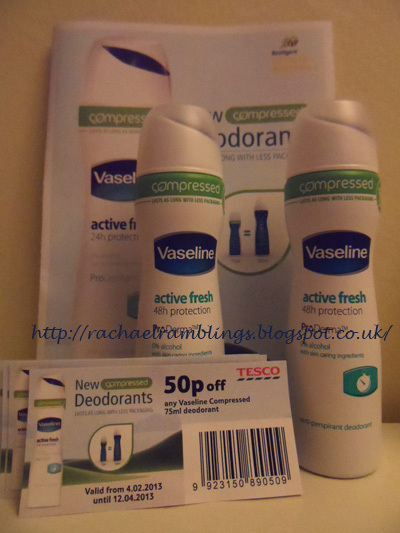 So I was rather pleased to be picked by BZZAgent to review Vaseline's compressed deodorant. This can is small its only 75ml but has the same effect as 150ml (is the claim). The fact it is small is a bonus as it fits nicely in your handbag should you wish to take it out with you. When I used it on Wednesday I did 'top up' when I got home but I realised this was out of habit not necessity. I then read the notes again and it did say to use it as you would your 150ml can. I also tested the white make problem we encounter with deodorants. On Thursday I sprayed my deodorant and then put on a black top - no marks! And finally, this deodorant has that distinct Vaseline frequence to it which does make you feel clean and fresh. I'm pleased with the results of this deodorant and will be using it in the future as it ticks the main box to me and that is - it lasts all day! It's what you need when running round after a toddler before going to work in a warm office, running errands lunch time and an afternoon of work. I am a BzzAgent and was sent these cans to review and report back to BzzAgent my findings and also let my friends and family know how I found the product.